Of course I love fresh blueberries in the summer when they are at their peak, but here’s a fantastic way to enjoy them the rest of the year. Bow Hill Blueberries makes pickled blueberries from heirloom organic berries picked fresh on their farm. They make a lot of other amazing products too but these are my favorite. I was so inspired I had to make some blueberry bowls! 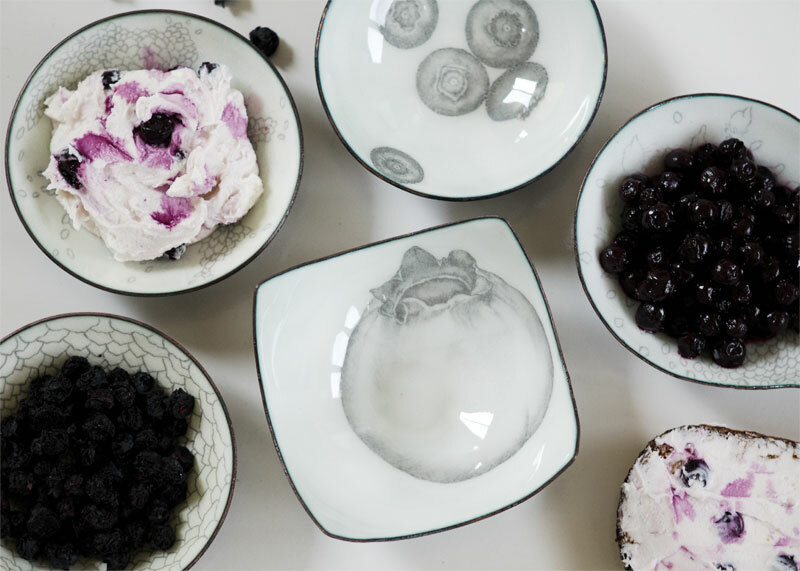 After forging copper into bowls and adding a base layer of vitreous enamel, I sketched the blueberries with a graphite pencil and fused the drawings between layers of glass. I’ll have these one of a kind bowls this Saturday at Gobble Up, a show devoted to artisanal food and products for your table. If you’re in Seattle, please stop by! Bow Hill will also be there. An enameled copper blueberry bowl and jar of pickled blueberries would make the best gift for your favorite foodie. Shown above are Bow Hill’s pickled blueberries mixed with goat cheese (which is freaking amazing!). This mix or a little bowl of the berries would make a great accompaniment to a cheese plate at your next holiday gathering. People will rave about your foodie prowess. And if you have left over pickled blueberries, here’s a yummy SQUASH SOUP recipe. I couldn’t stop at blueberries! I’ve also made a series of one of a kind herb inspired Bitty Bowls that will make their debut at the show this Saturday. Come early, I only made 8!